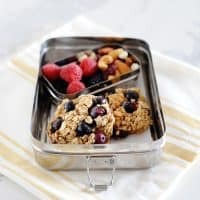 Are you looking for a healthy sweet treat to send in your child’s school lunch? Boy, do we have a treat for you! 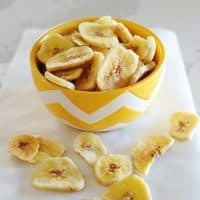 Why not send a high protein snack like Greek yogurt in their lunch? While chocolate chip cookies are the most requested treat around our house, the mere mention of anything cookie dough related is always a hit. 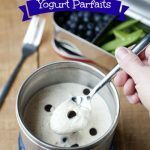 While there isn’t always time to whip up a batch of cookies for a lunch box treat, this cookie dough yogurt comes together quickly and is a dessert you can feel good about sending off with the kids. This easy recipe comes from one of our MOMables menus, just a sample of our kid-friendly recipes and what you can expect to find each week. If you don’t own a thermos, you should consider purchasing one. For around $10-$16, you will be able to put dinner leftovers to use, send cold treats to school… oh the possibilities! Check out this video to see how to send a parfait to school in a thermos. 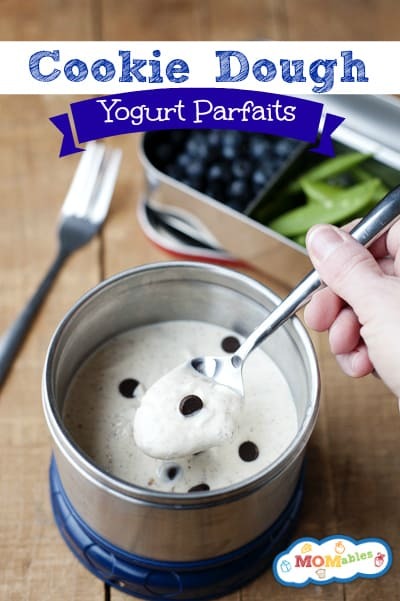 In a small bowl, mix yogurt, peanut/almond butter, maple syrup and chocolate chips. Place inside a chilled thermos container and pack in lunch box with your child’s favorite sandwich, fruit and veggies. Its so delicious hope my niece like this. Her birthday is coming and she likes yogurt in different flavor. I am rating your post too.